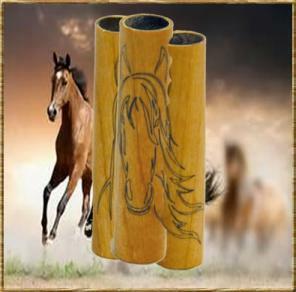 Our Inlay Blanks are designed and produced by us. 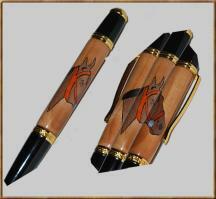 These blanks result in a pen that is such a great conversation piece and are truly a piece of functional art! Check back often to see what we've come up with next! 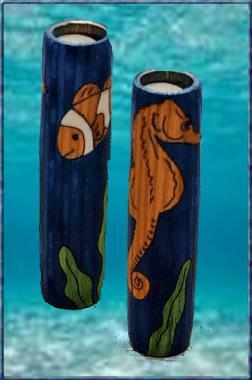 Most of our Inlays are available in both the 27/64" and 3/8" Tube sizes. Pen Kit not included. Those that include a colored tube are noted. But make sure you compare tube length to the one that came in your kit, there are slight length differences. IMPORTANT if you are going to make a click pen, any tube included with an inlay will not work, (due to length) you will need to use the tube that came with your kit and can use Acrylic Paint if you want the tube to be black. See something you like but would prefer it in different colors? If I have the color available I will be glad to change it up for you. If you see the color in any other blank on my page, that means I can do it. When you order just put a note in the comment section requesting the color change. VERY IMPORTANT SHIPPING NOTICE. 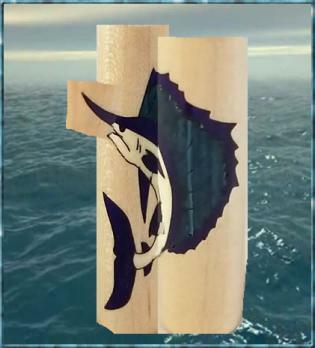 INLAYS ARE CURRENTLY RUNNING AT 5-7 DAYS FROM ORDER TO SHIP DATE. THANK YOU FOR YOUR PATIENCE. Done all in Lines with the Eyes and Nose in Dyed Black Maple. 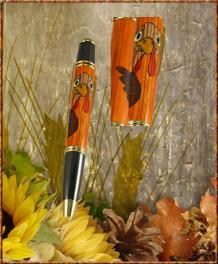 This Blank is available in both 27/64" and 3/8". 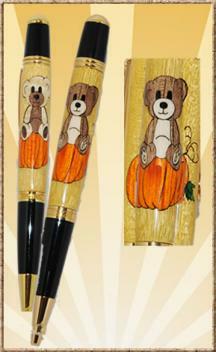 This blank is available for both the Monet/Gatsby and the Bolt Action Pen Kits. Please make your selection from drop down menu below. This is another design that wraps all the way around the blank! There is enough room for the clip but the buck design takes up the entire blank. 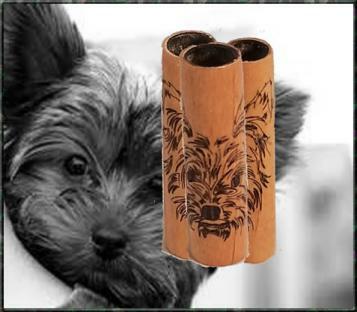 I've pieced the picture together to try and give you an idea of the whole design. There are 9 pieces. 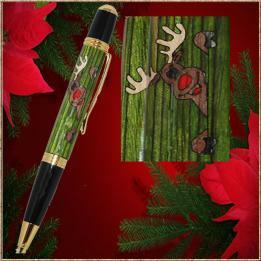 Since the Antlers wrap around the pen they are in 4 pieces. or similar kit which is sold separately. 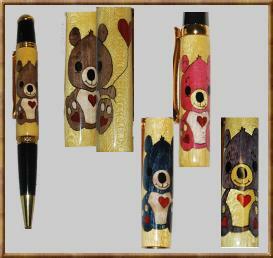 Click on image for larger view and to add pen kits. What a Beauty. This is no tiny Butterfly. One of the wings wraps close to 1/2 way around the pen! Note: This kit has small pieces on the lower wing. 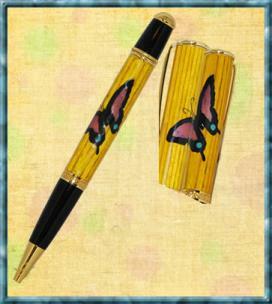 This is for our Monét, Celtic Elegance or PSI Gatsby Pen kit. For all you cat lovers....Can do either Green Eyes as shown or Yellow. If there is another color you see on one of my inlays that you would like, just put a note in the comment section on your order. 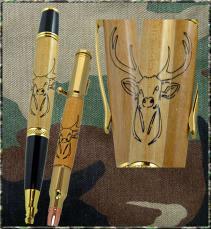 Blank available for both the Monet/Gatsby and the Bolt Action Pen Kits. Please make your selection from the drop down menu. 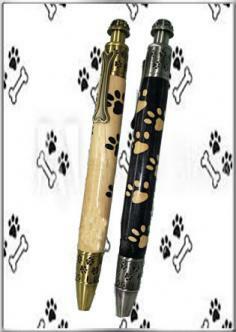 These blanks are available for both the Monet/Gatsby and Bolt Action Pen Kits. Please make your size and color selection from the drop down menu. My 3/8" Inlay blanks are just under 2-3/8". The Accent Extensions are aprx 3/8" each and come 2 to a pkg. 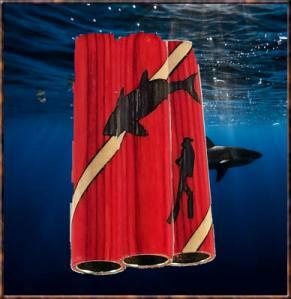 In putting all three pieces together you'll have about 3-1/8" to work with. of the older single tube 3/8" kits. 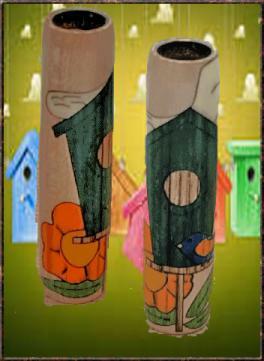 All my inlays tell you what colors I use on them so that can help you choose an Accent Extender color you would like. I've made the price of this pretty low. This went so well for us for the short time we had on the site for the 2016 ride, we're going to leave it up and see if we can give them a nice big donation for the 2017 Hogs for Dogs ride. This is burned all the way through but like some of the others, there are no removable pieces. Almost looks like a sketch. Another highly requested blank has been a Hummingbird, so here it is! As with most of my blanks it wraps all the way around the pen so I've done the picture in sections. Flowers - Red Acrylic w/Osage centers. Click on image for larger view or to add accessories. You can choose between Maple Blank w/ Paduak Longhorn Steer Inlay, or Paduak Blank w/ Maple Longhorn Steer Inlay. 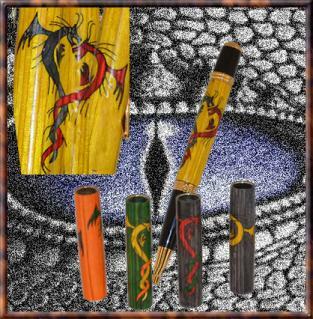 This blank is available for the Monet/Gatsby Twist and the Bolt Action Pen Kits. Please make your selection from the drop down menu below. 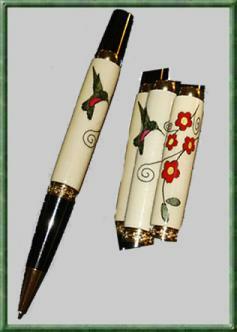 Click on image for larger view or to add pen kits. 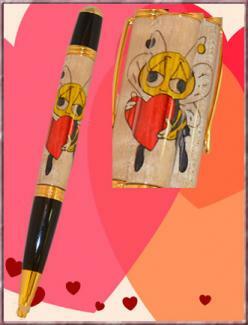 Everybody loves to be loved..with this little guy, you'll always be reminded that you are loved! Currently offering the Pink and Purple. If you'd like a different color you can note it in the comment section on your order. If I have it, I'll be glad to replace the mane with your color choice. 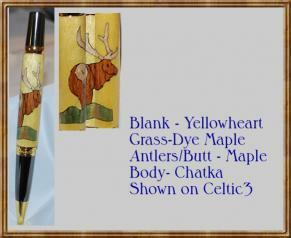 This blank is available for the Monet/Gatsby and Bolt Action Pen Kits. Please make your selection from the drop down menu. VIP. PLEASE READ!!! 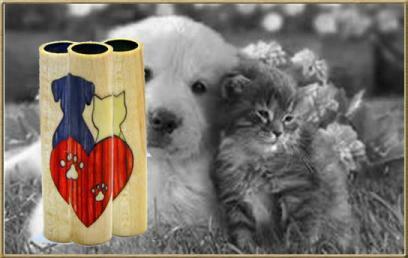 The blank on this inlay is 2 1/2" long and does not fit the PSI Dog Paw Pen Kit. 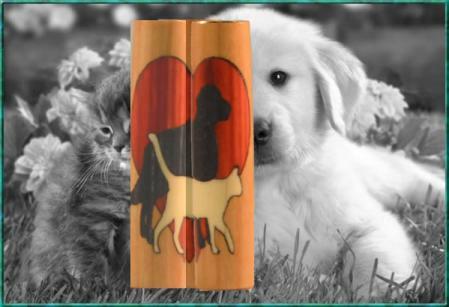 This inlay is a great animal theme. Animal lovers will enjoy this one. 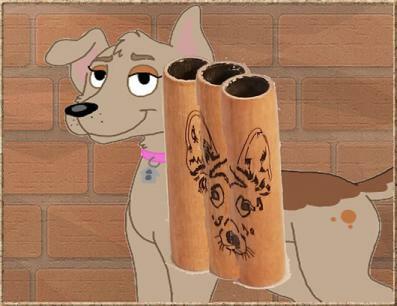 There are 4 staggered paws on the blank. I hope you enjoy this little guy. I designed him so he appears to be peeking out through the inside of the pen. 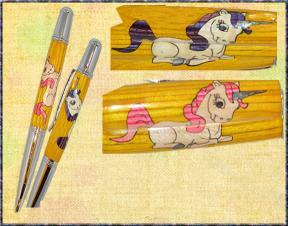 Available for both the Monet/Gatsby and Bolt Action Pen Kits. Please make your selection from the drop down menu. VERY IMPORTANT!! Since these are dyed blanks you will definitely need to use a skew to get a nice smooth finish and then go directly to your CA finish. If you sand you will get the dyed dust(carry over)into the base blank and it will not look very pretty. 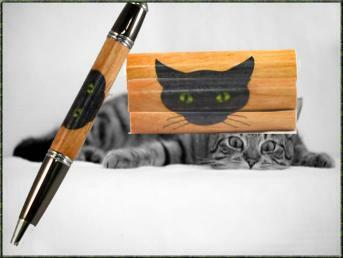 This blank is available for both the Monet/Gatsby and Bolt Action Pen Kits. Please make your selection from the drop down menu below. VERY IMPORTANT!! Since some of the pieces are dyed you will definitely need to use a skew to get a nice smooth finish and then go directly to your CA finish. If you sand, you will get the dyed dust (carry over)into the base blank and it will not look very pretty. 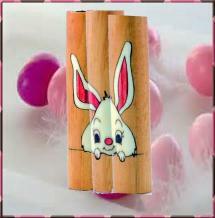 This blank is available for both 37/64" and 3/8"